Santa Clarita offers the ultimate Southern California lifestyle with endless opportunities to get outdoors and enjoy the sunshine while biking, running, hiking and swimming. Spending quality time with family and friends is easy to do at one of our many parks, along our trails and exploring our open space and nearby lakes. Santa Clarita offers year-round events for everyone including several summer concert series, seasonal festivals, cultural and sporting events. The best part is Santa Clarita is centrally located to everything in L.A and is home to Six Flags Magic Mountain and Hurricane Harbor! Just 30 minutes north of downtown Los Angeles, the city boasts year-round fun, abundant sunshine, a unique blend of upscale sophistication and small town charm, historic elements, destination dining, signature shopping, outdoor adventure, and a variety of world-class events, scenic drives and attractions. These characteristics and more make Santa Clarita a must see destination when visiting Southern California plus our location makes Santa Clarita the ideal home base for your Los Angeles and Ventura County adventures. 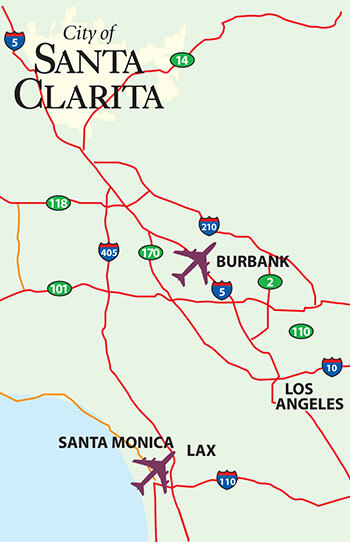 Santa Clarita seamlessly blends the best of California and is conveniently located near all that Southern California has to offer, including Universal Studios Hollywood, the Los Angeles Zoo, Hollywood Burbank Airport, countless museums, Hollywood hot spots and more! From outdoor shopping, day spas, culinary specialties, picturesque golf courses, recreation trails, dozens of beautifully landscaped parks and significant points of interest, you’ll find there’s plenty to do and experience in Santa Clarita.